After spending two complete days at the “Happiest Place on Earth” we are exhausted! Tomorrow we are going to head home, our plans of driving up the scenic Highway 101 have gone out the window. It’s time for us to be home. I’ll try to blog about the last few days later. (I’m only writing this now because a certain grumpy man was complaining!) Right now, I’m headed to bed! Awww…look at those three beautiful faces. Minnie’s ears have sequins now? I haven’t been to Disneyland in years either. My, how things have changed! I love the shiney Mickey ears! Your trip looks like it was a blast, and what wonderful memories you will have after your girls are away from home and busy with lives and trips of their own. I still remember some of the trips I took with my mother while I was in High School, and even the early years in college since I was fortunate enough to live at home. Can’t wait to read about your last few days. Looks like everybody had a good time. Those are much fancier Mickey Ears than I remember. Y’all are so gorgeous! Look at Mimi’s smile. Okay, now look at yours. Carbon copy!! I lurve me those ears. Great pic. That is the sweetest picture! Have a safe drive home. Hopefully you’ll still have some pretty scenery. And boy have those ears changed! Mine didn’t have any bling! I hadn’t looked at this since I posted it. Geez we look horrible! LOL We had loads of fun though! Aren’t the new ears fun? I couldn’t belive how many different kinds they have. The few times we went when I was growing up, I so longed for the only kind of ears they had, the plain black ones with my name embroidered on it. 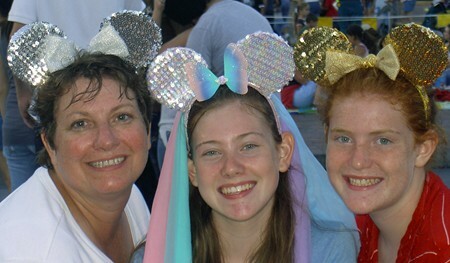 I guess that’s why I bought the girls some overpriced ears!